← Doh! Shop Space epiphany! I noticed while I was putting together my six board chest that it was wobbling on the bench. Uh oh .. need to flatten. Unbeknownst to me, some one else was also flattening his French Robou Oak Bench yesterday. Love my No. 6 for this job. This entry was posted in bench, workbench, workshop and tagged workbench. Bookmark the permalink. Boy, you jumped on that. Way to go. it seems a year goes by before I actually get to it. Maybe, you could come visit me and “show” me how to do this. I’m afraid I might mess it up. At first I assumed you only needed to flatten a portion and that gave the golfer’s tan, but has the light from the window (in pix) caused a visible line? Maybe not a severe issue in your neck of the woods but I wonder what sort of effect direct sunlight has on top drying/warping issues, for shops with southern exposure for instance. Good post as always. Thanks! I had put boiled linseed oil on my top and fir naturally darkens over time. I get very little sun on my bench since the garage faces north and only has the one window on the east side. I ended up flattening the whole thing but that corner needed a fair amount of work. Once I got the corner flattened I just needed a pass or two over the rest of it. I wish I’d spent a little more on the wood for my bench too, but hindsight is usually 20/20. 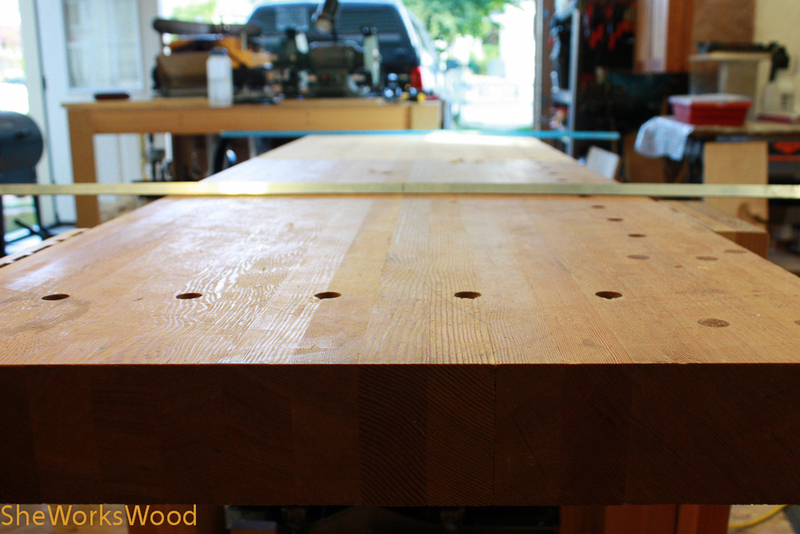 I bought the reclaimed fir beams I used for the bench top for a song, and at the time the only tools I had were a low angle LN plane and some cheap chisels. I pretty quickly added a scrub plane and a jointer plane (and others, eventually). 1. Too many knots. Clear wood would be SO much nicer. I wish it was a little finer grained too. 2. I wish I’d oriented the grain 90 degrees so the quartersawn face would be up. My bad, as they say. But the biggest “wood” issue I’ve had is the expensive (well, relative to the fir) Red Oak I bought for the leg vise chop. It’s done it’s best imitation of a potato chip every time I’ve surfaced it. Hopefully with the laminated setup it will be stable. One can hope. It’s been in the clamps for almost 48 hours now, I’m about to unclamp it and see what I ended up with. Yes, the fir I used was clear and I haven’t had the sap issues that you have had. When I redid the top it flattened pretty easily and smelled wonderful. Ohhh, yeah… I forgot about the “sap issues”. Gotta love green wood. I already flattened my bench, I couldn’t wait. It took longer to sharpen the iron in my plane than it did to flatten the bench top (it has a nick in it). Nicely done! I too build my Roubo style bench out of laminated 2×4 and 2×6 for the legs and stretchers. I salvaged it all from an old house, so every surface is marked by nail holes and stains. 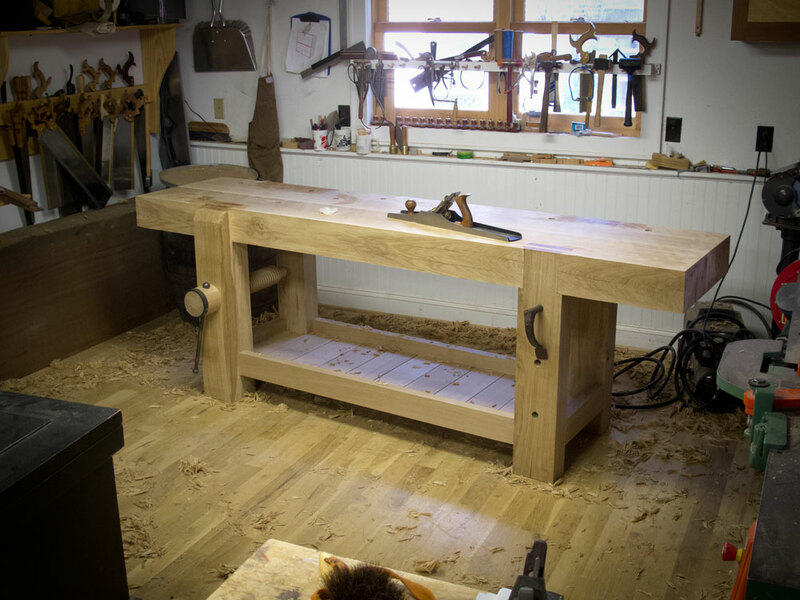 I have not had any issues with my bench feeling “too light or springy” due to the 3-1/2 inch thick top. I would have liked to bluid the top out of 2×6 laminated together, but wasnt enough in the house for salvage. Once again, super job on the bench and have fun using it.